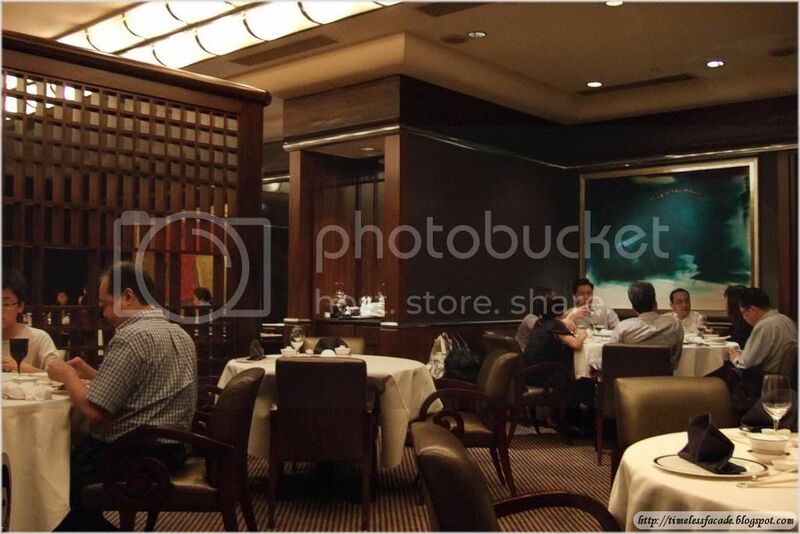 In conjunction with their 30th anniversary, Business Times offered a set dinner for 2 pax at Jiang Nan Chun for only $30 NETT! 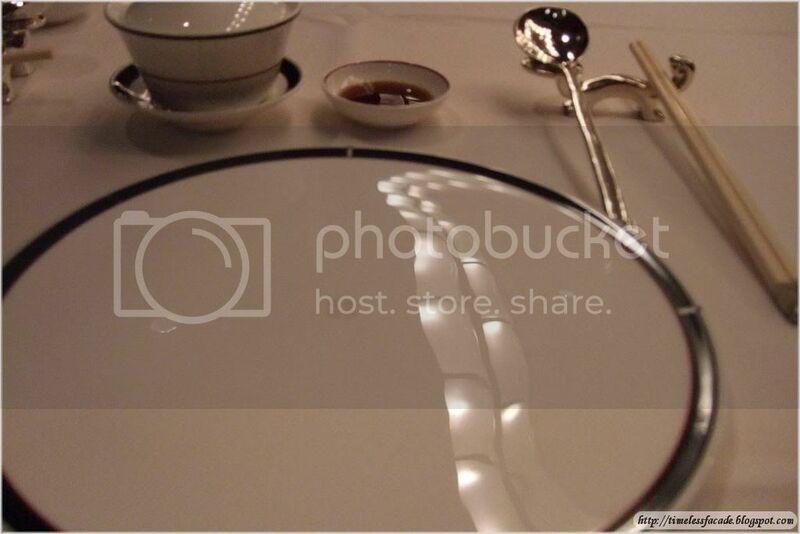 Naturally I was excited and after much difficulty, managed to get a table for 2 pax last evening. I had initially wanted to try our One Ninety, but it was fully booked even though I had called at 0830hrs the day the advertisement was published in the newspapers. Imagine that! 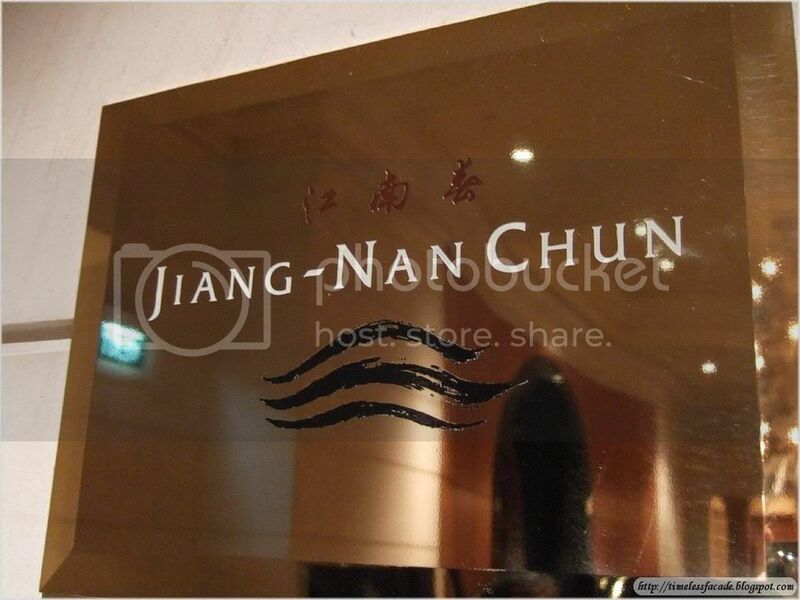 Jiang Nan Chun is the flagship Cantonese restaurant of the posh Four Seasons Hotel just along Orchard Boulevard. 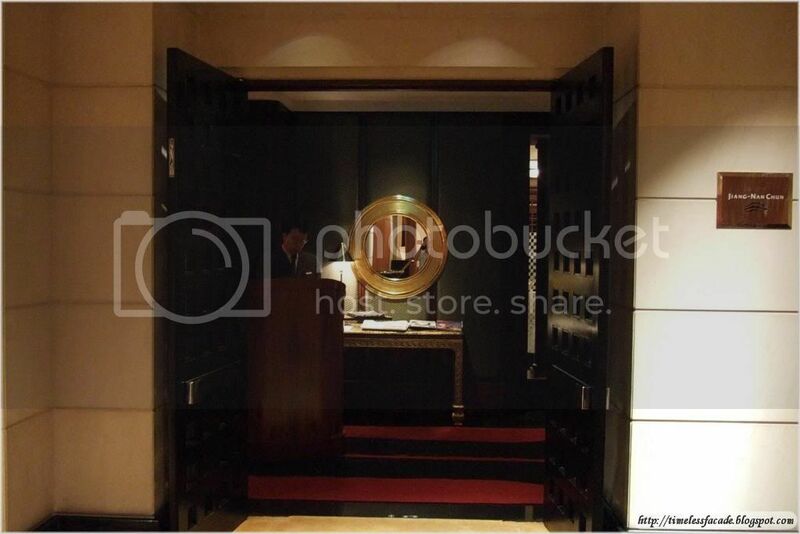 Its entrance was done up in sombre black with an air of exclusivity. Inside, the main theme revolved around the use of wood, with the walls and partitions spotting wooden finishes. A rather nice place, but pales in comparison to other restaurants of similar standing, like Li Bai, Min Jiang @ One North or even Peach Blossoms. Since we were there for the promotion, there was no choice of food, although we did add on a few items. The menu of the day included Consommé of Chicken with Chinese Mushrooms, Chinese Cabbage and Bamboo Pith, Steamed Fillet of Cod with Black Fungus Mushroom, Red Dates and Shredded Ginger, Braised Vermicelli with Salted Fish and Minced Pork and Chilled Mango Pudding. We added on a single serving of Yang Chow Fried Rice and Rice Flour Crisp coated with Maple Syrup and Sesame Seeds. 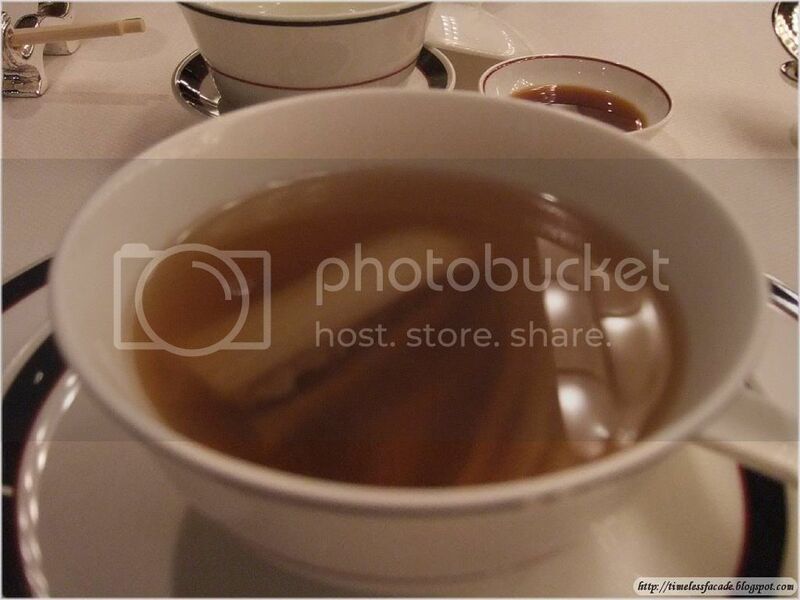 The Consommé of Chicken with Chinese Mushrooms, Chinese Cabbage and Bamboo Pith was very flavourful, probably due to it being double boiled, but too much flavour isn't always a good thing. I personally found the soup a little too overwhelming maybe because I like soups that are light and easy on the palates. I like Cod Fish for its smooth flesh and minimal raw fishy taste and Jiang Nan Chun's offering didn't disappoint. 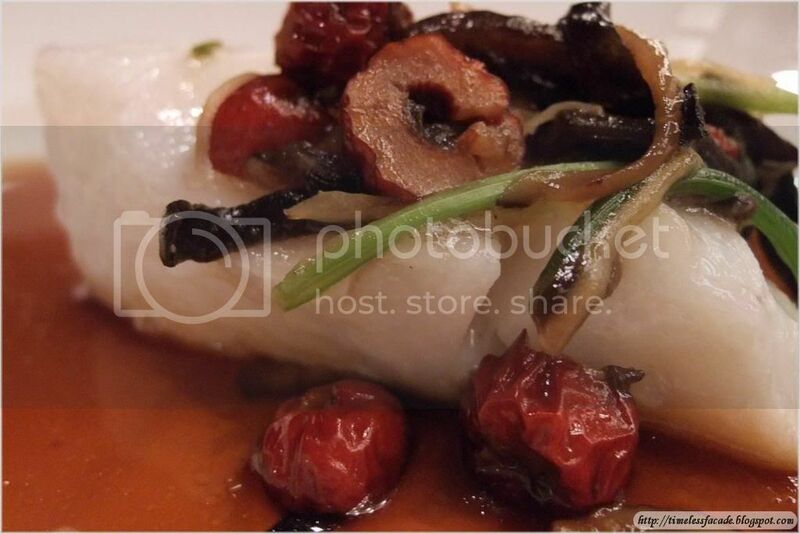 The Steamed Fillet of Cod with Black Fungus Mushroom, Red Dates and Shredded Ginger was soft and tender, with the red dates giving it a slightly sweet taste, much like the mangoes in Hai Tien Lo's rendition. However I did find the gravy a little heavy on the sweetness. 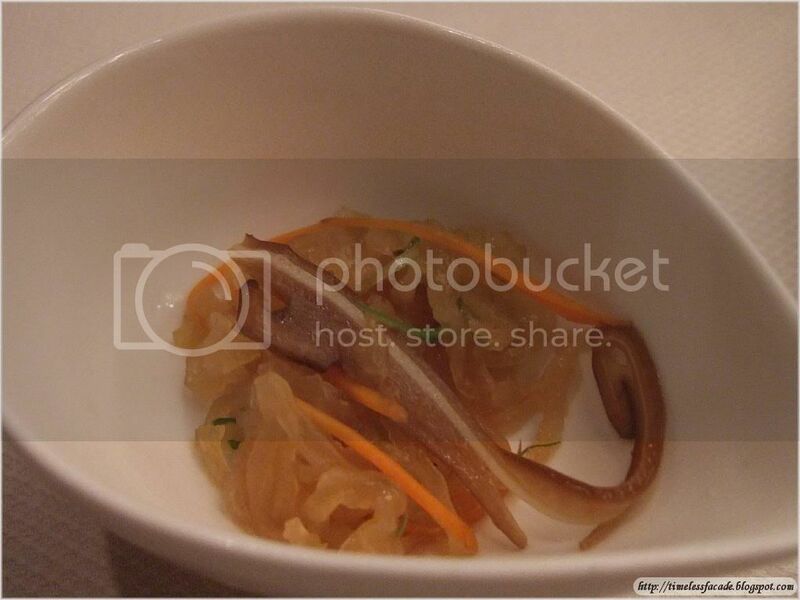 Joke of the day best describes the Braised Vermicelli with Salted Fish and Minced Pork. 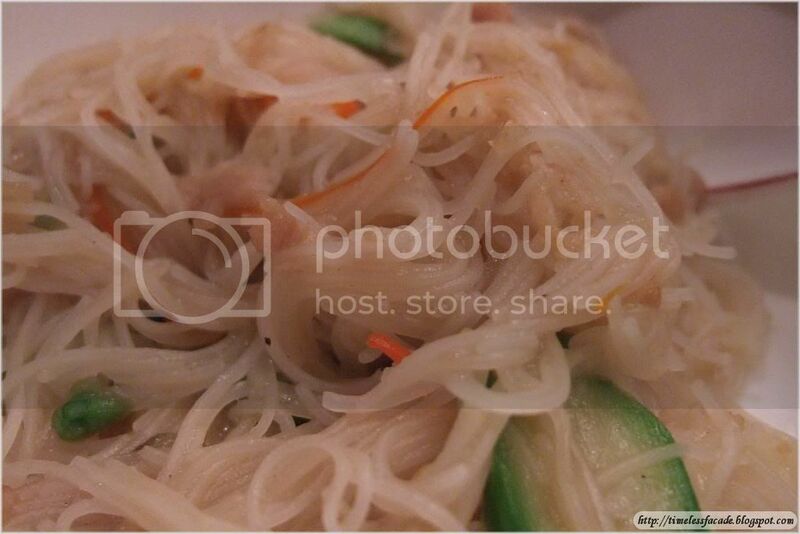 It was too soft, a result of soaking the Vermicelli in water for too long and it was practically tasteless. I have eaten better fried Vermicelli in hawker centres. To think that it is listed as one of the Chef's specialties. Geez. My extra order of Yang Chow Fried Rice was pretty normal. Sure the ingredients were generous and the rice evenly coated and fried, but it wasn't fragrant enough. 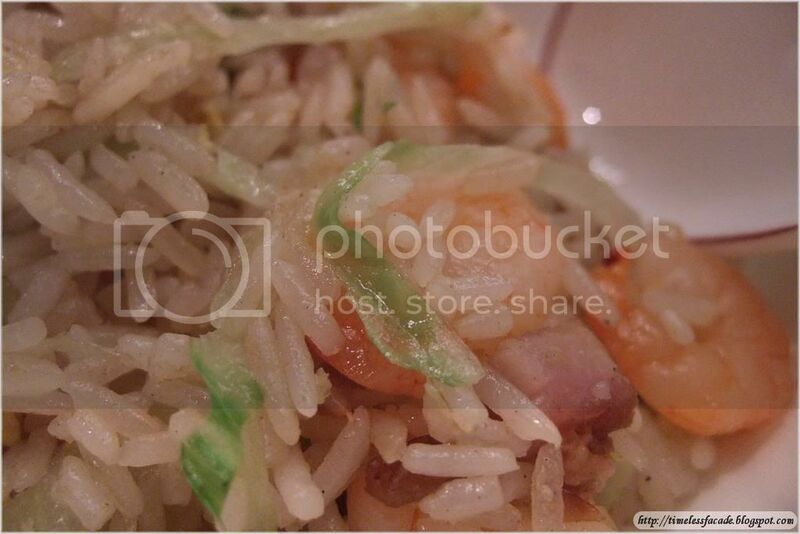 Add the dryness of the rice and you get a lacklustre offering. 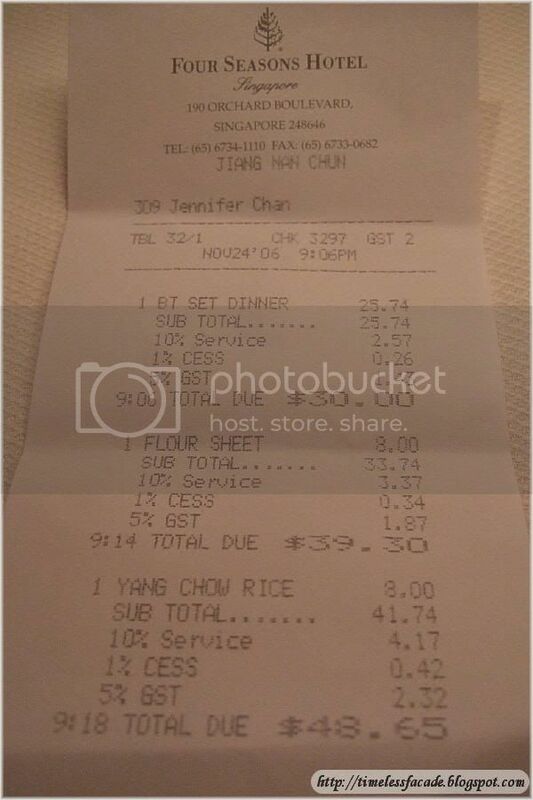 Serving size is about a third of your neighbourhood kopitiam's $3 fried rice, but it goes for $8 instead. In all honesty, I liked the desserts most of all. 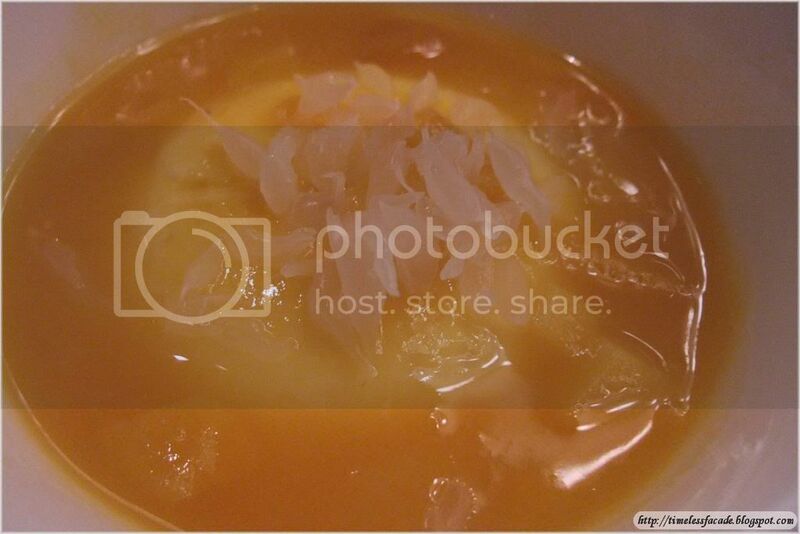 The Chilled Mango Pudding was very smooth and refreshing without being too sweet. Strands of Pomelo added bite to the dish. 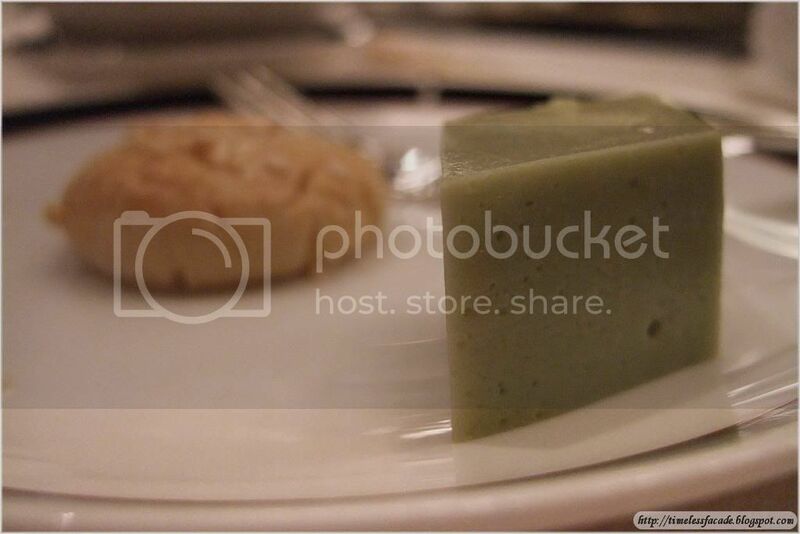 Accompanying the Chilled Mango Pudding was a small serving of Avocado Pudding and Almond Biscuit. While I found the Avocado Pudding a little bland, I did like the Almond Biscuit. It was freshly baked and not too dry or soggy, with a slight almond taste. Last up was my other additional order of Rice Flour Crisp coated with Maple Syrup and Sesame Seeds. 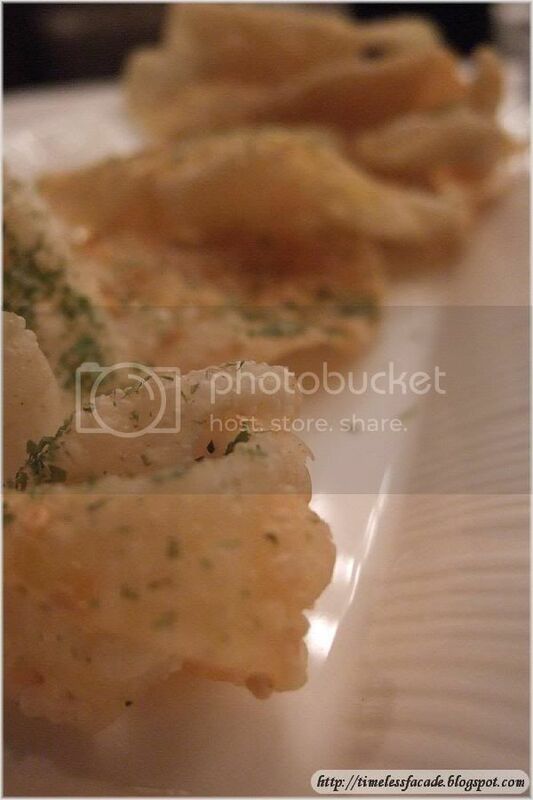 It looked like Keropok (fish/prawn crackers) with a sprinkling of Sesame Seeds and god knows what. But I liked it! It tasted like Kellog's Honeystars, albeit a crispier, lighter and not so sweet version (For those who have never tried Honeystars, please go to your nearest supermarket and grab a box now). A slightly above average dinner for 2 pax stood at $48.65/-. Cheap because of the promotion. 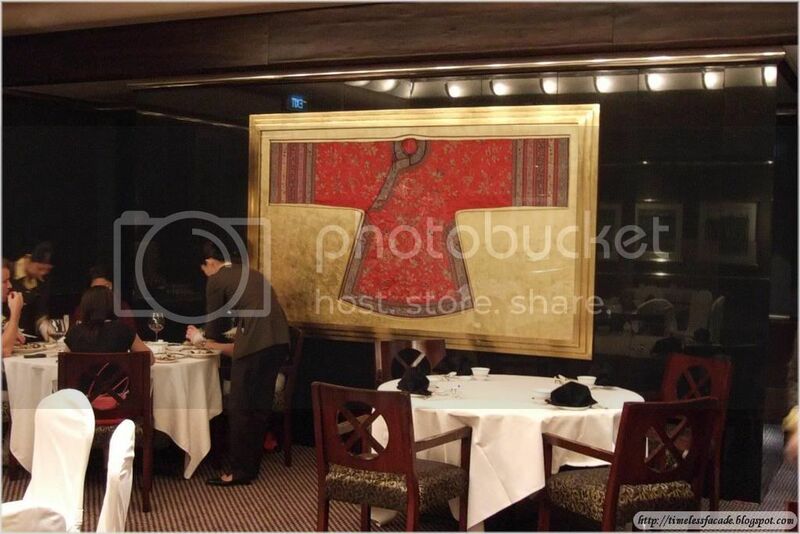 If not, prices are rather steep and alot of the dishes are priced per head. Service is generally good, but could well do with a little genuine friendliness.